and getting the kids on board too. we have been having a lot of discussions on the difference between reducing, reusing and recycling - and the hierarchy of prefer-ability here. our words became actions yesterday. 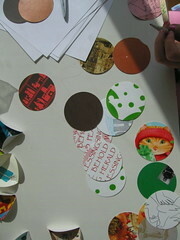 last year we spent time cutting circles out of our received holiday cards as they came down off the piano. (handy 2 1/2" circle punch was a big hit with the kids and the activity was a perfect quiet distraction for a post-holiday afternoon.) 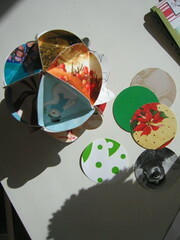 this year we are reusing them in the construction of some holiday balls (oh elementary school memories here!) - to hang along our diningroom light fixture. while i thought i would remember how to do this - when i sat down it escaped me. a tutorial was found here. with hanukkah just around the corner i am looking for something quick and easy to do with the bag of my father-in-law's ties i still have stashed in the cupboard after my belt-making of a year (or 2!) ago. i am thinking headbands and cuffs... any other ideas? i've got a bag of my father's ties, too. i love the belts you made. i've always thought that my dad's ties would turn into a quilt someday. or part of a quilt. i've got his dress shirts, too. i'll be watching to see what else you come up with! and i love the paper balls. the r, r, r concept coming to life for your girls. so great. I think the headbands are a great idea! love the balls! Think I am going to have my first ever xmas tree this year, may just make my own balls! I have a huge bag of old cards - I've been waiting for inspiration, and this is what I've been looking for! ps - where did you get your 2.5" hole punch? No ideas for the ties but I wanted to tell you if you have any extra cut outs that we do the same thing every year but instead of making balls, we use the cut outs for gift tags...reuse baby! Grumbles and I spent the afternoon making snowflakes out of my father in law's old business print outs, so I'm totally with you in the MeRRRy spirit! Thanks again for posting the directions and the photos!